Lately I have been very busy and have had little time to post blog entries. It is a catch 22 because I enjoy posting entries, but I also like guiding and being really busy too. When I am out there guiding all of the time, it gets tough to make time for posting entries to keep all of you readers up to date on what is going on. I tend to make up for the lack of summer entries in the winter when days are short and there is plenty of time to sit in front of the computer. 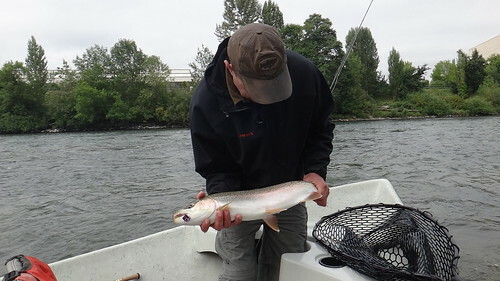 Anyhow, lately the fishing has been relatively steady with consistent action and pretty good weather patterns for trout and steelhead fishing. As for the smallmouth fishing, it has been so so, but I tend to do most of my smallmouth fishing when the summer doldrums hit and the high pressure and high temperatures dominate the air. This summer has been very pleasant and consistent with temperature in the upper 70s and many overcast mornings (unlike the rest of the country). Trout fishing has been steady with lots of fish being caught each day out, but not many large fish have been caught which is semi standard for the mid summer fishing times. 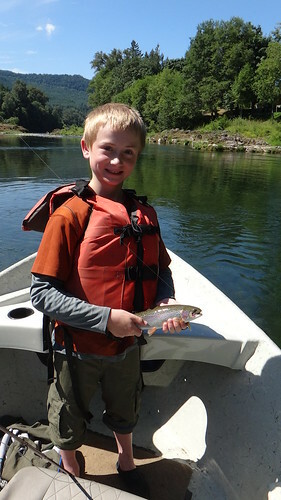 Typically spring and fall offer the trophy trout with consistency while the peak summer time offers numbers when you are out there. Of course a heat spell can trash that, and make the day tough to catch each fish, but we have not had that kind of fishing yet. Dry fly and dropper set ups have been the best producers along with swung softhackled wet flies in the surface film. Hatches have been mainly pale morning duns and smaller caddis with some little yellow sallies and adult golden stones. This is the time of the year when there is the least "hatch-a-tivity", but the fish are looking for food offerings and that is the reason why you can do very well with a large dry and dropper set up for your daytime fishing. 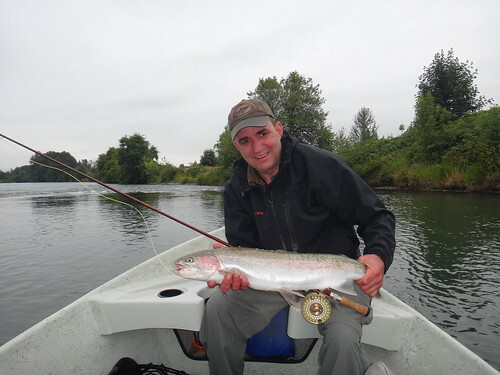 Steelhead fishing has recently gotten a lot more consistent for me on my trips where we are tending to have multiple hookups each day out, and the crowds have been back and forth depending on the day. Fish are really taking a variety of swung wet flies and the numbers of fish have really filled into the river systems. Water levels have hit the summer lows which cause the conventional angler to lower their catch rates; while the fly guys start to shine. Nymph fishing to sighted fish has also been productive when you are not a in spot that offers good swing fishing, or if the fish is holding in a upstream of you position.